Four immigration protestors today stormed the field at Nationals Park during the fifth inning to demand that Bud Selig move the 2011 All-Star Game in Arizona in response to the state’s immigration reform laws that empower state and local police to enforce immigration issues. 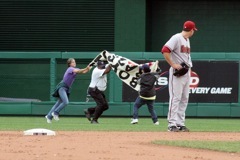 Two protestors came onto the field initially and distracted most of the on-field security, while two others tried to use the fracas as a distraction to unfurl their banner on the field. They were unsuccessful. A security guard took down the protestors trying to open their banner before it was exposed. The text of the banner reportedly read, ﻿”Bud Selig Move The All-Star Game / No SB1070,” according to the Post’s Adam Kilgore. Video courtesy of Hal Mangold, click through for the high-res original. Running onto the field at Nats Park is, according to a team official, considered to be unlawful entry, a misdemeanor according to DC Code §22-3302, which is subject to a $1,000 fine and/or up to 180 days in jail. I was there and it totally rocked. Good for those folks calling out the racists in Arizona! I’m all for free speech, but why did free speech today have to interrupt the baseball game that was going on? Deport the criminals. Take KellyBlu with them. I have a strong feeling that most of the folks calling for the illegals to be deported from this country are white folks. For some reason, it seems as if many whites appear angry about this subject more so than others in our country. What gives? Why are so many whites so angry? The majority of people who consider themselves non-Caucasian in the U.S. who I happen to know personally as friends are not as bitter when talking about undocumented workers living among us. My non-Caucasian friends also refuse to call undocumented workers “illegal aliens” because know one is illegal….we’re all human beings regardless of our immigration status. conservative as well as liberal leaning people of all ethnic groups).